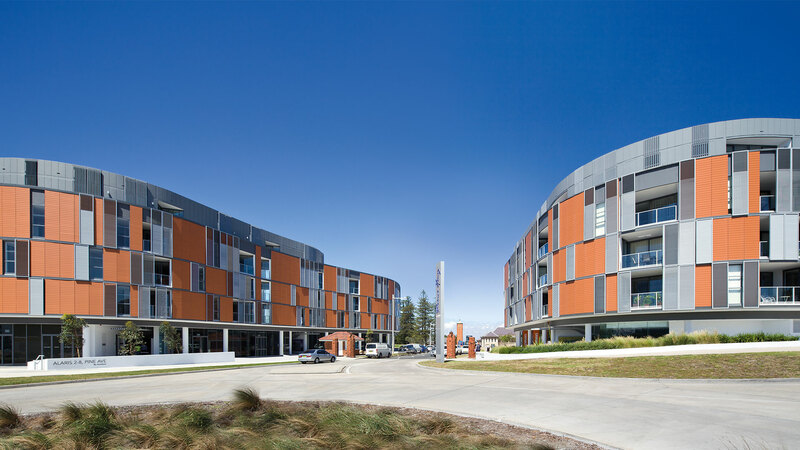 This pair of related apartment buildings forms an entrance to a new residential community located on the historic former Prince Henry Hospital site, a site that includes many heritage buildings and overlooks the beautiful waterfront of Little Bay. The design proposals for these two buildings—Manta and its sister Alaris—have been drawn from an analysis and reading of the particular qualities and characteristics of their locality and context. 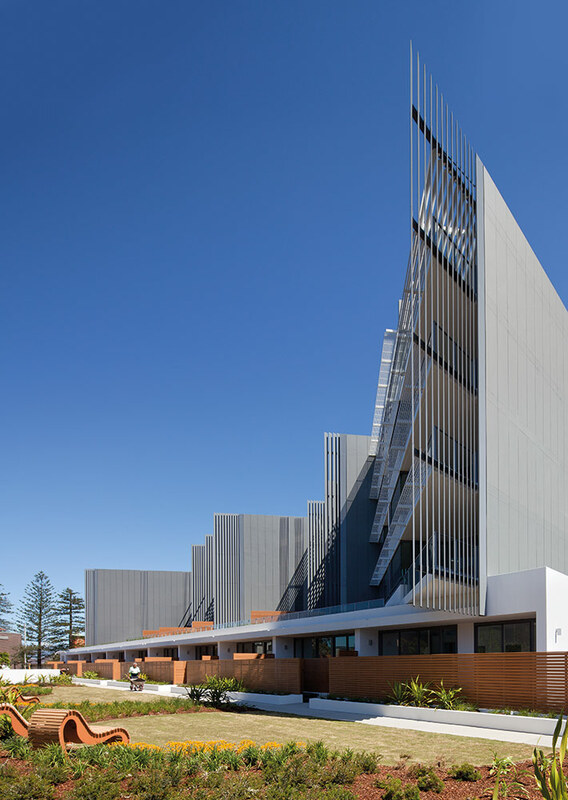 Their sinuous forms compress and then open out in a strong entrance sequence to the Prince Henry site, reinforcing the corners at the intersection of Pine Avenue and Anzac Parade, then stepping down and peeling back to reveal a new public space and the elegant façades of the historic Flowers Wards, the heritage landscape and coastal vistas beyond. The new north-facing open space and ground level retail accommodation create both a communal focus and commercial heart for the Prince Henry community. 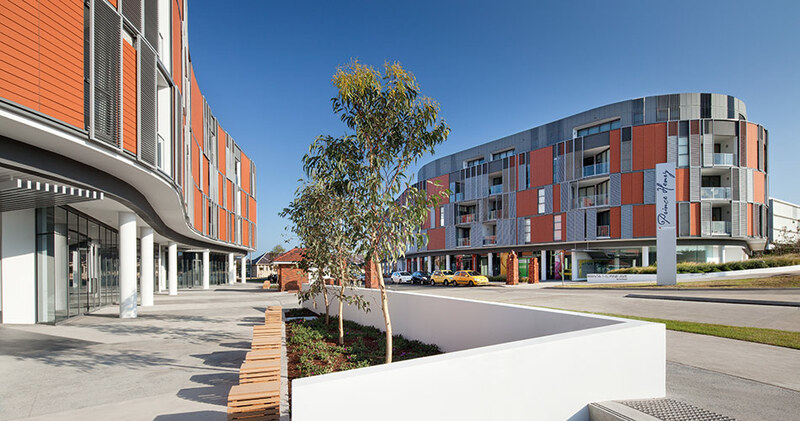 Behind the screened façades raised above street level, three to four levels of apartments are oriented toward the easterly views, the city and Botany Bay. A random pattern forms the primary street walls, while providing shade and privacy to generous private open space and interiors beyond. The orientation of the apartments and avoidance of overlooking is a direct result of building form and internal planning initiatives. In particular, the overlooking of primary living areas and external private open spaces, as well as the number of apartments facing each other across Pine Avenue, is minimised. 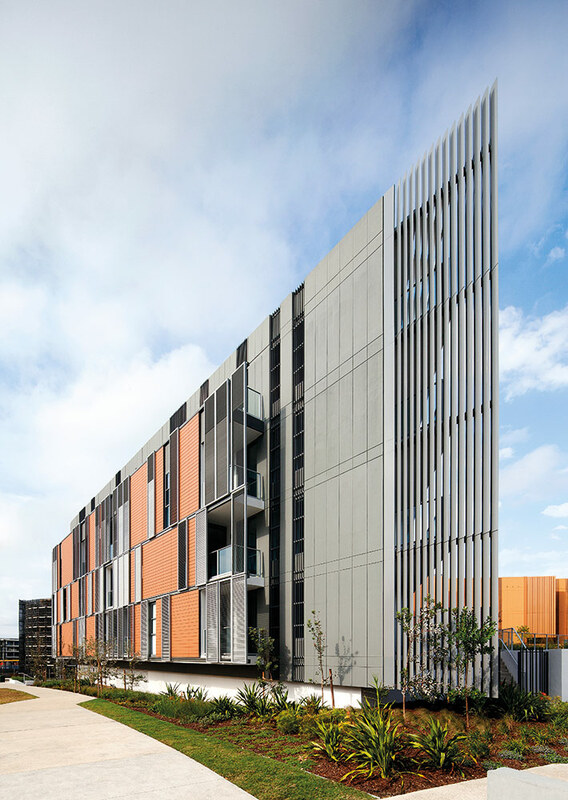 External shading systems and staggered vertical blades further augment the performance of the buildings. In the context of budget-constrained floor area, apartments are designed to maximise efficiency. The majority of plans provide media areas, minimise circulation space and maximise liveable space.  They are positioned to take advantage of prevailing breezes and promote cross ventilation, including single-oriented apartments, which are augmented with solar stacks. Each living space aligns with a generous private open space, which together with garden terraces and communal landscaped areas create amenity for residents, as well as attractive foregrounds to views. Foyers, dispersed along the buildings’ primary address, are clearly marked by dramatic awning structures and lightboxes featuring interpretive heritage imagery provided by the adjacent Nursing and Medical Museum. They create a site-specific experience for residents and visitors, affirming Prince Henry’s past at its most public interface.